The pilot episode (Spotify link, but you can listen online here without a Spotify account) centers on Nirvana’s final studio album, In Utero, which celebrates its 20th anniversary this year. Unfortunately for Nirvana fans—and for Spotify—the pilot episode of Landmark is kind of a horrible mess. This episode features recorded phone interviews and commentary from Nirvana bassist Krist Novoselic and In Utero producer Steve Albini, as well as interviews with The Meat Puppets’ Curt Kirkwood and comedian Bobcat Goldthwait, who toured with the band folllowing the album’s release. While this collection of commentary should amount to a treasure trove of pure fan boy goodness, it comes off as a chaotic jumble of sound clips. Rather than edit all the clips together into long-form documentary, in say the style of the far superior Nirvana audio documentary Nevermind, It’s an Interview (Spotify link), Landmark is sliced into dozens of little snippets, which all haphazardly flow into each other. Listening is a jarring and annoying experience. If you remember buying this, you are old. The series cuts every segment into its own track. Every segment. For example, track two is a five-second introduction of the series that is immediately followed by a four-second track introducing Krist Novocellic, which is then followed by a minute-long track of Krist speaking. This wouldn’t be that big of a problem, except that it is either not edited properly, or the app does not skip through the tracks in the way Spotify intended. Either way, all the hard edits make the thing nearly unlistenable. I have to assume that the episode was originally meant to be presented as several longer tracks, but it was later cut into smaller cuts to accomodate more ads. This was a mistake. While Spotify has every right to sell ads to its audience, the less annoying path would have been to create various multi-minute long segments (see: Nevermind, its an interview) in-between which Spotify could sell concert tickets and Squarespace deals. The pilot episode of Spotify Landmark does succeed in one way: The “’In Utero’ with Commentary (US/MX)” playlist interjects the original album tracks with commentary tracks talking about the background of the individual songs. That works. 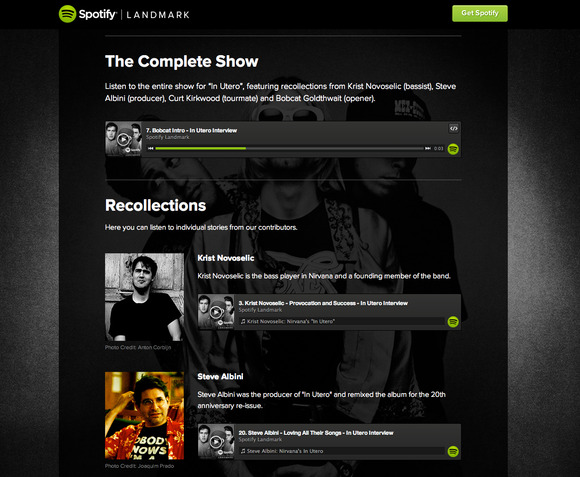 A Spotify spokesman commented over email that the service doesn’t yet have any more episodes of Landmark to announce. However, it is probably safe to assume more are in the works—the website refers to this episode as “Landmark 1”. While Landmark is an unfortunate mess (that could still be fixed with the right editor), I hope this is the type of content we can see more from Spotify or other streaming services in the future. Spotify is rumored to be experimenting with different forms of original content across dfferent mediums. Original aural documentary series could certainly be a way to drive listeners to the service and separate it from the ever-growing list of streaming competition.